For those with no prior CrossFit experience the Fundamentals Course is your entry point to the CrossFit programme. The FREE Fundamentals Course consists of 2 sessions, (F1 and F2) both of which last approximately 90 minutes in very small groups (usually 1-1). Each course will be led by one of our highly motivated CF-L1 coaches. The two parts of the course should ideally be completed a few days apart; we suggest Monday for F1 and Friday for F2, but we can be flexible if these days don’t work for you. The Fundamentals Course has been designed to meet the fitness needs of any individual, and teaches you the basic skills you will require to tackle the daily WOD (workout of the day) or to take part in the group CrossFit classes. 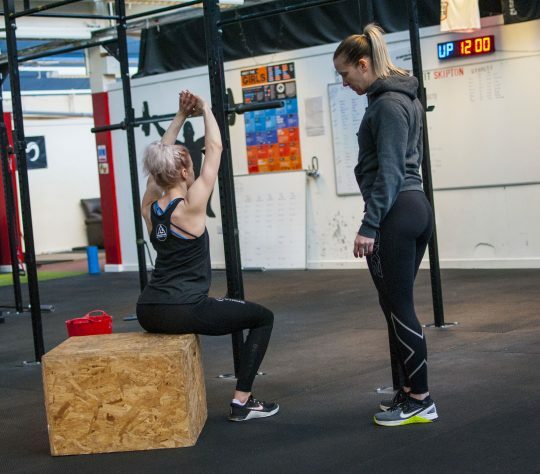 At CrossFit Skipton, we not only want to make sure that you get the safest, most effective workout, but that you’re part of our extremely friendly community before you start your first group class. Upon completion of both parts of the course, you can rest assured that you’ll possess the knowledge and techniques you need to be safe when using the equipment. ​How Much does the Fundamentals Course cost? Currently the Fundamentals Course is absolutely FREE! When is the next Fundamentals Course? We are flexible, so can fit the fundamentals sessions in when it’s convenient for you. How do I Sign Up for the Fundamentals Course? What happens once I’ve completed my Fundamentals Course? Upon completion of both parts of the FREE Fundamentals Course, you decide which membership you’d like to go with and jump straight into a CrossFit class whenever you like (remember, none of our memberships involve lengthy contracts so you can change at any point). We do not have beginner or advanced classes. Crossfit workouts are completely scaleable and our experienced coaches will ensure everyone, regardless of ability or fitness level, has an effective workout. I’m experienced with CrossFit, do I need to do a Fundamentals Course at CrossFit Skipton? No! If you’ve got previous experience of CrossFit and you’re competent with the movements that CrossFit involves, you can just purchase a membership and jump straight in.